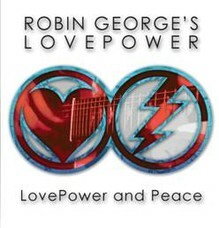 LovePower and Peace, the charity CD by Robin George and 60 Artists from the world of Rock, Blues and Soul, as well as 200 children is released on October 3rd 2011, with 100 per centof all profits going to three charities, All artists, Studios and the record company have given their services for free. YouTube edits: Search for "Robin George LovePower and Peace"
Charities: Haven House Children’s Hospice, Essex, Compton’s Hospice, Wolverhampton, BCAT (Birmingham Centre for Arts Therapy). The album is a truly eclectic mix of Rock, Blues and Soul and features over 60 musicians from bands such as Thin Lizzy, The Climax Blues Band, The Rolling Stones, Elton John, UFO, Motor Head, Asia, Uriah Heep, Alice Cooper and solo artists such as Ruby Turner, Daniel Boone, Arthur Brown and Jaki Graham. "The Love Power band's performance will keep you coming back for a replay day after day ... Great iconic tune with all the right sentiments..." Mark Wheeler, TNT-audio. For details of our celebrity endorsees and video’s of the making of the charity check out http://www.robingeorge.co.uk for more news and info. (Macmillan Cancer Support, registered charity in England and Wales (261017) Scotland (SC039907) and the Isle of Man (604) *Paid to Macmillan Cancer Support Trading Limited a wholly owned subsidiary of Macmillan Cancer Support to which it gives all of its taxable profits.